Team17, a global games label, creative partner and developer of independent, premium video games in partnership with award winning Indie Studio Ghost Town Games is thrilled to announce a new update for Overcooked 2. To celebrate the Chinese New Year, new recipes, new chefs and new kitchens are available for players. The Chinese New Year update is available now digitally on Xbox One, PlayStation 4, PC and Nintendo Switch™, free of charge. This second piece of seasonal content for Overcooked 2 transports players to a new map where they will face culinary chaos in seven stunning new kitchens. Enjoy the tranquility of Koi ponds, incense and drifting lanterns as you get to grips with two new recipes: fruit platter and hot pot. Just be sure to keep your wok hot! 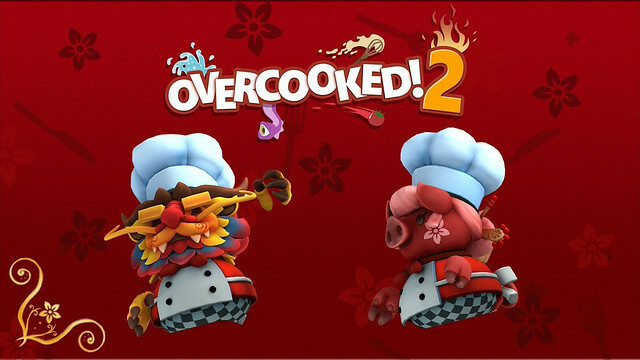 Two new chefs will be joining players for this journey, ornate dragon chef and Chinese New Year pig chef. The update also sees the introduction of “Survival Mode”. In Survival Mode you must serve as many dishes as possible in the time given, with each dish served adding precious seconds to the timer. Survive for as long as possible in this frantic race against the clock! Survival mode is available for all levels in the main game, the Surf ‘n’ Turf DLC and both seasonal updates. New kitchens! Experience seven new kitchens, beautifully themed for Chinese New Year. New kitchens mean new hazards and so watch out for the dancing dragon who has mistaken your kitchen for a parade route! New recipes! The simple yet delicious fruit platter is a traditional Chinese New Year dish that signifies fullness and wealth. Hot pot is a great dish to make with friends and family so chop some bok choi, prawns, and meat and get cooking. Just don’t forget the noodles! New mechanic! The Chinese New Year update sees the introduction of a new piece of cooking equipment: woks. Used for cooking hot pot, you must make sure that it remains bubbling by keeping the wok over the lit fire. New chefs! The Chinese dragon is ready to take the heat of the kitchen fires and the pig may be the 12th sign of the Chinese zodiac but is ready to be first in line for kitchen duties. The Chinese New Year update is available now digitally on Xbox One, PlayStation 4, PC and Nintendo Switch™, free of charge. SWORD LEGACY: OMEN IS AVAILABLE NOW!